Pen Gu island is known for two things: its ultra-hazardous surf conditions and its crazy penguins willing to surf them. Surf's Up the game (and the movie) is about the trying to win the island's annual surf competition. It lets you pick a penguin and go up against the best birds surfing has to offer in a series of wave rides that undulate between cresting and forming tunnels - all the fun parts of surfing. You clear areas by surpassing a goal score and then you can go online to try and get the highest score ever. Also like the movie, the game has mock-documentary style with clever between heat commentary, usually in the form of an interview or a news report from a walrus - remember we're dealing with surfing penguins here. You'll start with five playable penguins to choose from (err, four penguins and a rooster), and quickly begin unlocking up to 5 other surfing critters, new boards, surfing locations and other goodies (the unlockable punk rock soundtrack is great for riding the curls). All the first level benchmark scores are set pretty low, so unlocking all the courses doesn't take too long. Penguins' lack of opposable thumbs keeps them at a disadvantage for getting really high scores. Sadly, the game is not only shortened by the easy goals, but there are only five surf locations. Although they're subdivided into several courses each, defeating the nine-time surf champ and renowned jerk, Tank, to become the new, super-righteous surf champ, only takes a few hours if you really sit down and carve through it. Completing every secondary challenge will require quite a bit more time and practice, but like real surf competitions, you'll wish you'd gotten a few more runs in at the end of the day. The game uses a simplified direction pad plus button control scheme borrowed from skate games like Tony Hawk. 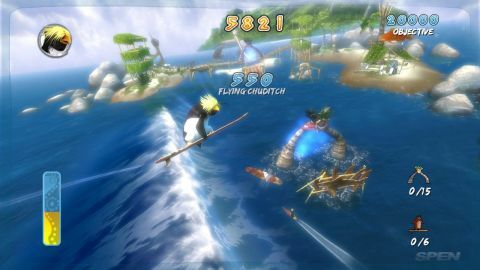 By holding a button and balancing the various fowl can grind on the top of waves (for surfers it's called a Floater, dude), do basic or advanced tricks and, once you've strung a few moves together to fill the energy bar, Stoke Mode tricks, the pinnacle of penguin athletics, can be used. Tricks of the same level always give you the same point value, which means less to think about, but it's fun to mix them up anyway because animating moves like the Beach Whale and calling it a trick made us chuckle.The SixAxis steering feels natural for surfing but it's difficult to stick with because it's not as precise as the thumbstick. Description Based on this summer's CG Sony surfing flick, Surf's Up promises innovative surfing mechanics and all sorts of characters and locations to play with - we'll see if they deliver.